WARNING: seats are limited, booking is recommended. REGISTER NOW! Access to Lab is only allowed to Codemotion Conference Ticket holders. 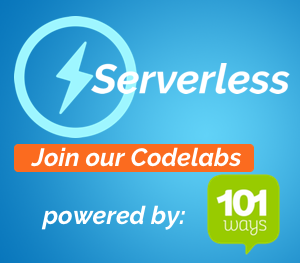 101 Ways experts are at your disposal to go into the serverless world: come and attend one of the free sessions in order to learn how to build a serverless project on your machine. Then, in the Serverless Clinic, you can come and discuss your issues with 101Ways Engineers. The codelab will take place on Tuesday, May the 8th, from 11:30 am to 5:50 pm: come and take a peek at any time. The entrance is free, reservation is not required, but recommended, in order to provide a better experience for the attendees. The codelab is addressed to web developers, frontend developers, backend developers, full stack developers. Book your seat! – seats are limited, booking is recommended!